Robert Finale Hand Signed and Numbered Limited Edition Hand-Embellished Giclee on Canvas:"Sacred Heart of Paris"
From the Art: Montmartre is among my favorite places in Paris. It towers a mile above the city. It offers an unparalleled view of the Eiffel Tower that leaves you breathless. A winding cobblestone street lies nestled between the two famous restaurant cafes Le Consulat and Le Bonne Franquette. Follow this road, you will find yourself in the sacred heart of Paris, the Sacré-C�ur Basilica. I envision in these sacred halls, struck in wonder at the magnificence before me. 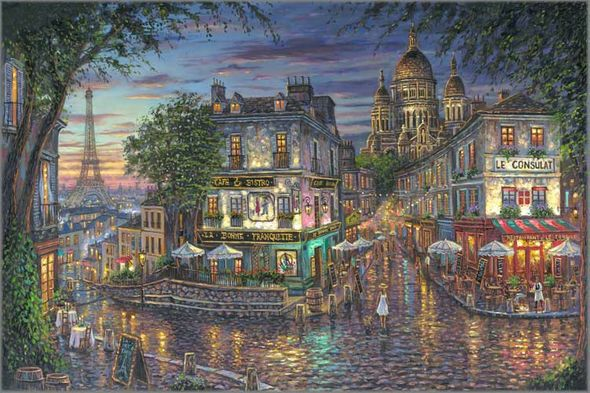 Montmartre is not solely a gorgeous jewel atop a crown that is Paris; it is also home to the local artist populace, where hundreds of artists come to set up their easels adorned with colorful umbrellas and artwork of all styles and complexity. Boasting some of the most awe-striking art, mouthwatering bistros, and unparalleled views of Paris; Montmartre is a priceless gem without equal, which one must visit on any expedition in this magical city.